NEI Glass provides fast, professional repair and replacement services for the glass in all types of heavy equipment. No matter how large the glass may be, the installers at NEI Glass are ready and able to tackle the job. Under normal operating conditions, more is demanded from heavy equipment such as semi-tractors, service trucks, and farm and construction equipment. As such, the glass in these vehicles is more likely to become damaged. Damaged glass on a vehicle with your logo reflects on your company and should be replaced expeditiously. NEI Glass is here to help! When glass breaks in your equipment, give us a call at (260) 665-1914 and we will get to work right away. 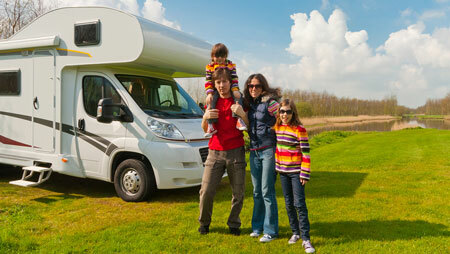 A broken windshield in your RV or motorhome can put a damper on any vacation. A broken windshield is unsightly and annoying, but it could cause much more serious problems if left unattended. The most notable and common type of damage comes from water infiltration. What complicates the matter more is the fact that you may be new to the area and will now have to find a reputable, professional glass replacement company to get you back on the road. After 20 years of glass repair and replacement in Northeast Indiana, NEI Glass has an excellent track record and should be the first number you call.